Remove the hood latch (A). Disconnect the hood opener cable (B). 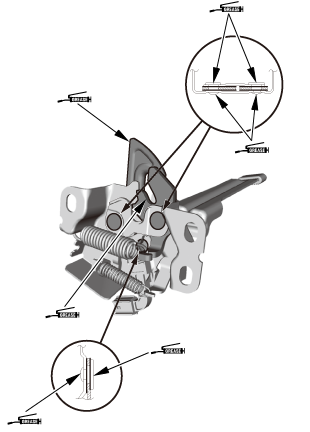 NOTE: Apply multipurpose grease to the hood latch as indicated by the arrows. Connect the hood opener cable (A). Install the hood latch (B). Slightly loosen the hood latch mounting bolts (A). 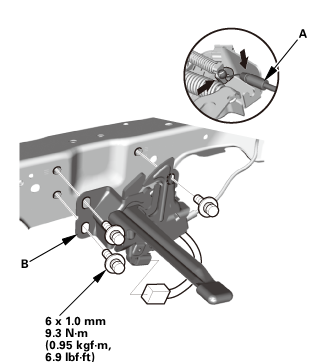 Adjust the hood latch (B) to obtain the proper height at the forward edge, and move the hood latch right or left until the striker (C) is centered in the hood latch. 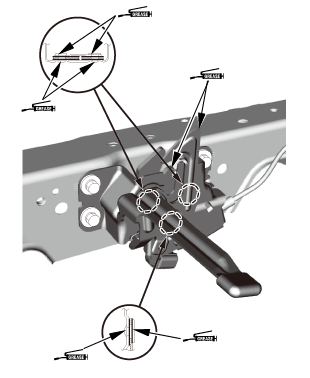 Tighten the hood latch mounting bolts to the specified torque. Make sure the hood opens properly and locks securely. 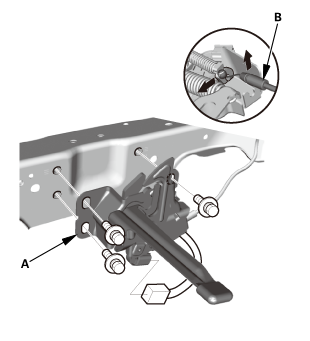 Apply multipurpose grease to the hood latch as indicated by the arrows.